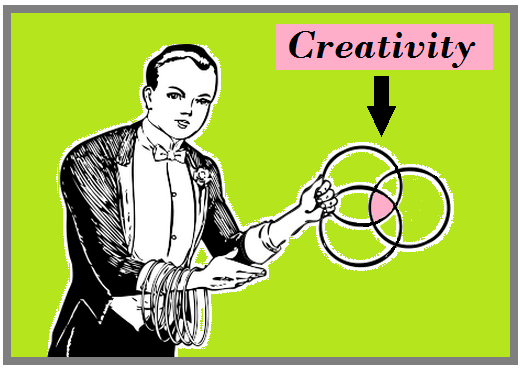 Transmedia storytelling was always inevitable, due to the systems model of creativity, the evolutionary algorithm in Culture, and the 3 Laws of Holarchies. 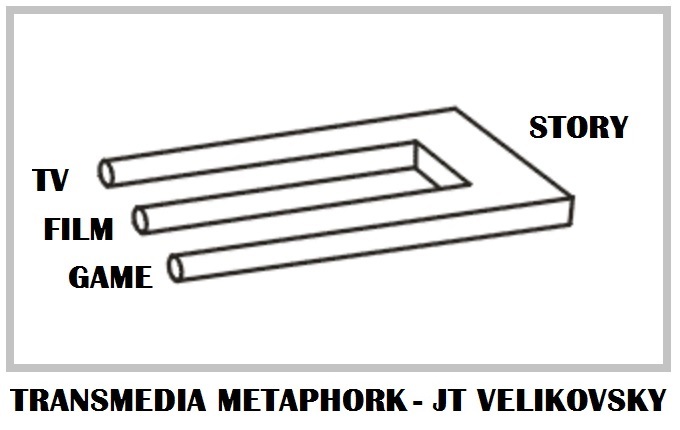 Post includes: Velikovsky’s 3 Laws of Transmedia. I bet Nietzsche would enjoy that title..? 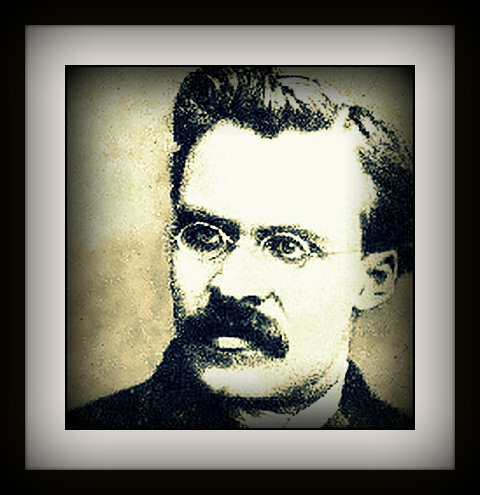 Fred Nietzsche – lifelong practical joker, and inventor of the Theme from Kubrick’s `2001: A Space Odyssey’. 4) Why I Am Destiny. 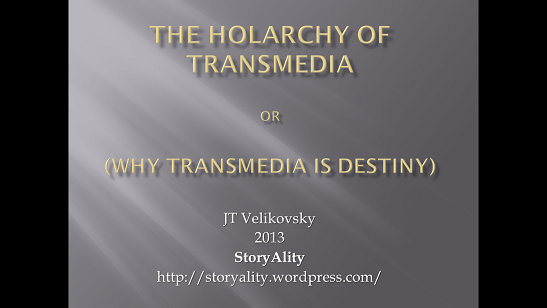 At any rate, here is why I think: Transmedia Is Destiny. I believe the word `transmedia’ first emerged in Professor Marsha Kinder’s use of the term `transmedia intertextuality’ in her 1990 conference paper about the Teenage Mutant Ninja Turtles in culture: “Animal Masquerade and Transmedia Intertextuality: or, Why I Love Being a Turtle” (Kinder 1991: 217). (For more, see the excellent Playing With Power, Kinder 1991). The reason for this inevitability is because: evolution functions according to the 3 Laws of Holarchies. Look at how hard Koestler is working here in this picture. Surely, he must have come up with a few good ideas, if he was thinking *that* hard. 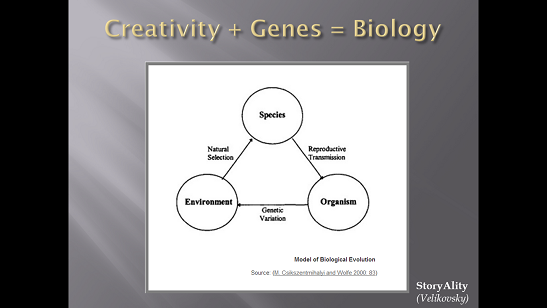 Mainly because: the evolution of culture works the same way as the evolution of biology. 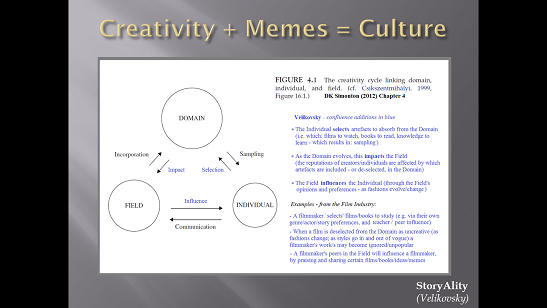 StoryAlity #100 – The structure of `the meme, the unit of culture’ – and the mechanics of cultural evolution . 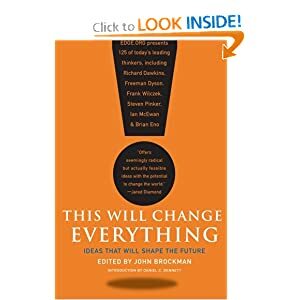 To unpack all this further, I need to refer to part of an essay in the book This Will Change Everything: Ideas That Will Shape the Future (2010). Scott Sampson is adjunct professor of geology and geophysics at the university of Utah. Today the commonly accepted concept of evolution is extremely narrow, confined largely to the realm of biology and a longstanding emphasis on mutation and natural selection. In recent decades, this limited perspective has become further entrenched by the dominance of molecular biology and its “promise” of human-engineered cells and lifeforms. Emphasis has been placed almost entirely on generating diversity, a process referred to as `complexification’, reflecting the reductionist worldview that has driven science for four centuries. Yet science has also begun to explore another key element of evolution: unification, which transcends the biological to encompass the evolution of physical matter. The numerous and dramatic increases in complexity, it turns out, have been achieved largely through a process of integration, with smaller wholes becoming parts of larger wholes. Note – What Sampson is referring to here, has a name: holarchies. 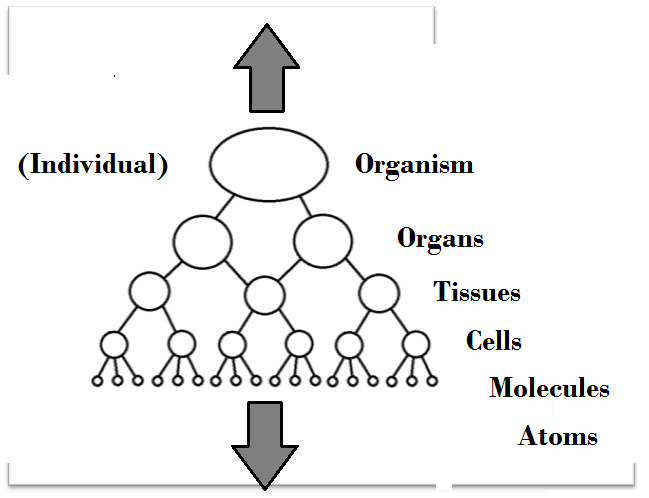 At each higher, emergent stage, older forms are enveloped and incorporated into newer forms, with the end result being a nested, multilevel hierarchy. At first glance, the process of unification appears to contravene the second law of thermodynamics, by increasing order over entropy. Again and again during the past fourteen billion years, concentrations of energy have emerged and self-organized as islands of order amid a sea of chaos, taking the guise of stars, galaxies, bacteria, gray whales and (on at least one planet) a biosphere. Although the process of emergence remains somewhat of a mystery, we can now state with confidence that the epic of evolution has been guided by counterbalancing trends of complexification and unification. 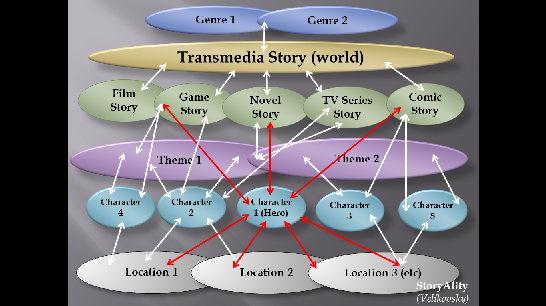 So, Transmedia is simply the unification of all media into: holistic (whole, single) story. 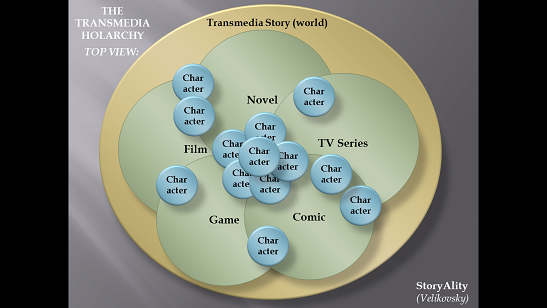 I like to distinguish between transmedia (a narrative extension in a different media) and adaptation. (Narrative replication / copying in another media.) So Cultural Evolution often works like Biological Evolution does. In the diagram below, Transmedia is narrative extension (the vertical, green axis) for successive chapters (e.g. Chapter 1,2,3,4, etc of a story). By contrast, Adaptation is the replication of a unit of culture (or a meme, a unit of story) in another media (the horizontal, orange axis and please note that it’s still just the same chapter [Chapter 1] getting replicated in different media when it’s adaptation. 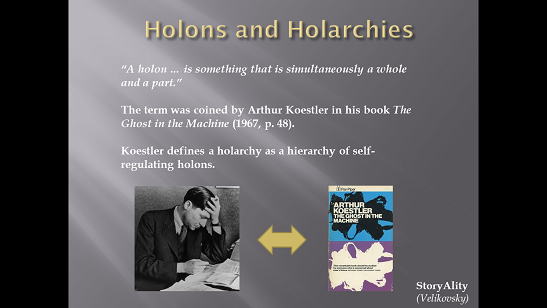 2) Storyworld – is underneath `Genre’ in the holarchy. The Genre commands/dictates the tropes (memes) of the individual (and sometimes, overlapping) Transmedia stories. The story always must integrate with the Genre (or, if not: must `bend’ the Genre `rules’ in novel-and-appropriate ways.) (e.g., The Storyworld contains cultural values: the Empire is evil; the Rebellion is good; the Jedi mythology, `Order 66′, etc). It also has a physical, cultural, economic, ethical and philosophical framework. 3) Platform: e.g., Films – Games – Novels – TV series – Comics. These are all commanded/dictated by the Storyworld. Each platform does certain things well (novels: character, film: spectacle; games: immersive interactivity; TV: character arcs; blogs: character backstory and insight; etc) and therefore each platform tends to integrate with specific certain `aspects’ of the Storyworld. 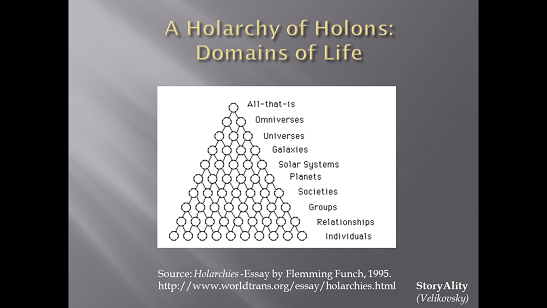 5) The Characters – are commanded by (and, integrate with) all the above levels in the hierarchy. As experienced Transmedia creators know – (as per: the 2nd Law of Holarchies) the various characters in Transmedia tend to `compete’ with each other, to be the `star’ of their own `show’ (story thread). i.e The cultural evolutionary algorithm (i.e. 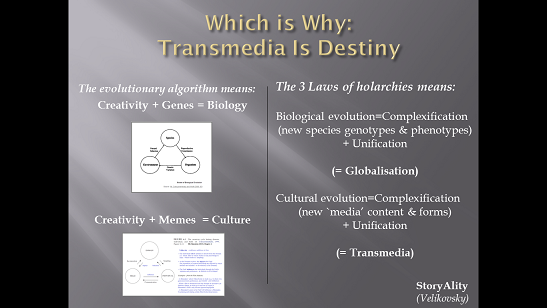 meme selection, variation, and transmission) produces diversity (story complexification), while at the same time the 3 laws of holarchies produce unity (i.e. story unification). Also – if you need a great guide to Transmedia `Bible’ creation, see Gary Hayes’ excellent Guide to Transmedia Bible Creation, here. And – for a great overview of the history of Transmedia practice, see Christy Dena’s amazing PhD on it, here. (or: does not result in goal achievement – given that all of the Top 20 ROI Films are `Villain Triumphant’ /Ancient Greek tragedy stories). That is to say, for example – a filmmaker (and/or: Transmedia Writer / Creator) may begin with (say) a character (e.g. `Mad’ Max Rockatansky, or say, `Guy’ and `Girl’ [from the film `Once’], or Napoleon Dynamite, Rocky Balboa (`Rocky’), Laurie and Michael Myers [Halloween], or Luke Skywalker, etc), around which, the other memes in the holarchy can then appear/emerge. Or even a Setting, such as with the film SAW (which was originally set in: an elevator). Notably all these stories/screenplays went through many drafts (notably, all except Paranormal Activity and The Blair Witch Project, neither of which had scripts when shot – but instead had Outlines/Treatments, from which the actors improvised). But – How and Why do they (the story memes / ideas in each case) appear/emerge? – In which order do they typically appear/emerge? The empirical evidence of how the top 20 ROI films were created would strongly suggest not – and, this is also a Romantic view of Creativity, for which no verifiable evidence exists (rather than a Rational view, such as is offered by Csikszentmihalyi with the systems model). Alternately, for example, a screen idea may begin from: a title (for example: the film Friday The 13th began this way, and was always influenced by the success of Halloween) – or, even a single line of dialog, around which the other memes/holons are then successively added, by the Writer. In each case, the evidence on how these top 20 most-memetic / most-viral films emerged / were created reveals that: starting with one `key’ meme, the Writer (and or/ a Screen Idea Work Group) used their habitus to select, vary, and include (or discard) related memes, until the story was assembled in the above (film story/screenplay) form. The process is clearly iterative and recursive; there is no distinct pattern to the order of how the individual memes (story ideas) in the top 20 ROI film stories were selected (by the screenwriter in each case) – and their stories thus constructed, therefore – the writer/filmmaker obviously has free will (agency) in terms of the order in which they select, vary and transmit these memes (screen ideas), into their `final’ screen idea. However the above film story structure is obviously predetermined overall; it is of course the structure of conventional feature film screen ideas – and therefore, of theatrical narrative fiction feature films. The writer’s overall film story (as: a memeplex) must conform to this structure in the finished film, regardless of the order in which the individual holonic memes (ideas) appeared, when the story and screenplay were created. In short, it doesn’t matter, when – or how – all these memes appear (or: where a Writer gets their ideas from, or even, what that initial idea is – as `bad/unfilmic’ story ideas will likely be `de-selected’ during the development process, which includes pitching the idea to experts in the film storytelling field), as long as when the final form of the story meme/holon emerges as a screenplay, it matches the above structure. 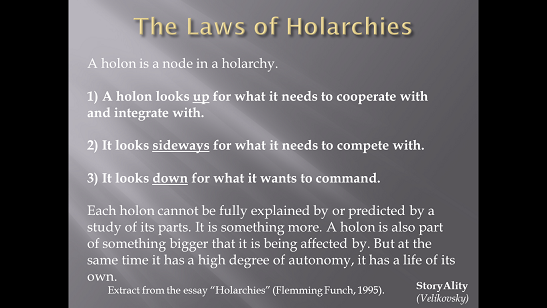 Everything single thing that exists is a holon, and a holarchy. So, given that: everything tends `downwards’ towards complexity, and also `upwards’ towards unification – Transmedia was therefore inevitable (and: will become ever more pervasive). – As they continue to evolve and diversify, all these forms (platforms) will at the same time tend to be unified, into: Transmedia Storytelling. The idea that will change the game of knowledge is that it is more important to understand events, objects and processes in their relationship with one another than in their singular structure. How shall this breakthrough occur? Current systems theories are necessary but not sufficient, as they tend not to take values into account. (3) As with Moore’s Law (which is not actually 18 months) – every 2 years, a new `storytelling platform’ emerges as: popular (achieves mass-market penetration), and provides a new media platform that is annexed by Transmedia. (e.g., Blogging: 1999; iPods: 2001; iTunes 2003; YouTube 2005; Facebook & Twitter 2007; smartphones 2009; tablets 2011; geo-located augmented reality tagging 2013, Google AR glasses 2015, etc). 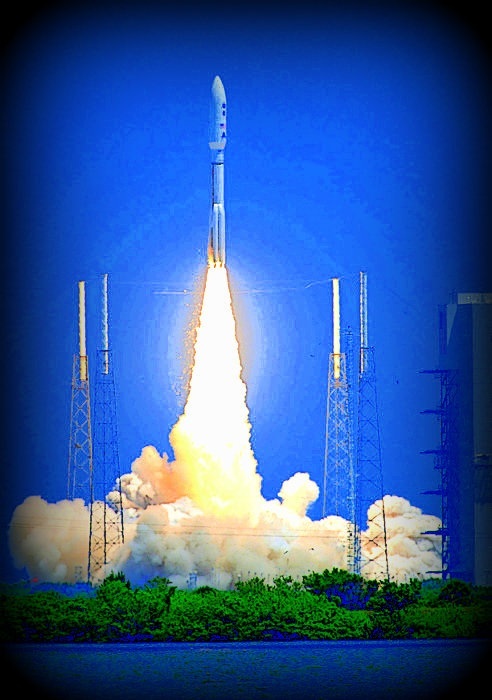 So – one of the tricks with Transmedia is to create a successful launch platform. For this reason (among others) I’ve been studying the Top 20 ROI (i.e. most viral) Feature Films of the past 70 years. Two of these films/stories were `Transmedia on launch’ (notably, Star Wars 1977 was not). I also wrote a paper on it. If it’s of interest, you can read a draft of it, here. And, some more about that (truly excellent) IDNet 2013 Transmedia conference, here. i.e. 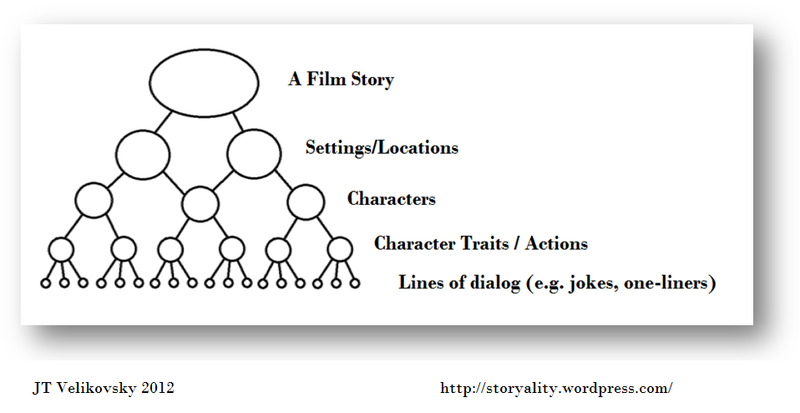 1) STORYALITY Screenwriting Manual, 2) a STORYALITY i-doc (interactive documentary/database documentary) – and 3) a `Creative Practice Theory’ game demo. – Many Thanks for reading it. Dena, C 2009, Transmedia Practice: Theorising The Practice Of Expressing A Fictional World Across Distinct Media And Environments, Department of Media and Communications, PhD Thesis, Sydney: University of Sydney, University of Sydney, i.e. : Download it here! http://www.christydena.com/phd/. Csikszentmihalyi M – in Brockman, John (2010), This Will Change Everything: Ideas That Will Shape the Future (1st edn. ; New York, NY: Harper Perennial) xxiii, 390 p.
Dena, C, (2009) Transmedia Practice: Theorising The Practice Of Expressing A Fictional World Across Distinct Media And Environments, Department of Media and Communications, PhD Thesis, Sydney: University of Sydney, <http://www.christydena.com/phd/&gt;. Kinder M. (1991) Playing with Power in Movies, Television, and Video Games: From Muppet Babies to Teenage Mutant Ninja Turtles, Berkeley: University of California Press. 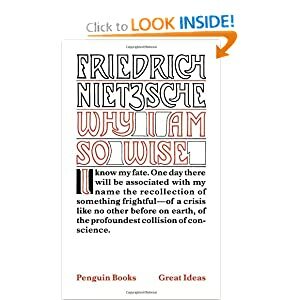 Nietzsche, F (1888) Ecce Homo (Or: Why I Am So Wise), reprinted (2005) NY, Penguin Classics. Sampson S – in Brockman, John (2010), This Will Change Everything: Ideas That Will Shape the Future (1st edn. ; New York, NY: Harper Perennial) xxiii, 390 p.
I think it’s a better idea for an audience. It’s a source of entertainment and effective for social networking. Thank you so much sharing this idea. The idea of transmedia was quite new to me, but the more I read your Storyality docs and transmedia, I started to understand it. I like the idea of transmedia (and the Storyality research) so much that my next film script is being written for the stage. Cheers, many thanks Tim. Hope the stageplay goes great guns!